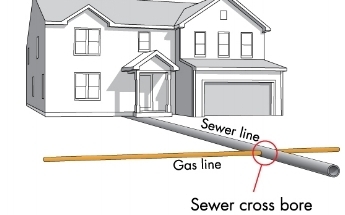 Cross bores can occur between different types of underground utilities that use horizontal or trenchless boring to install buried lines, including the intersection of a gas line and a sewer line or water line. This results in an intersection of the utilities, compromising the integrity of the utility and/or the underground structure. While uncommon, they can be disruptive, costly and potentially very dangerous. Using innovative CCTV camera inspection, PPM inspects for cross bores non-invasively using a main-line camera that launches through a sewer manhole. PPM partners with municipalities and utility companies across the eastern U.S. inspecting sewer laterals and eliminating the risks posed by cross bores. PPM has made a significant commitment and investment of almost $2 million in equipment, staff, training and infrastructure to help address this need for gas utilities. Skilled operators are thoroughly trained and experienced in and around sewer mains, laterals as well as gas mains. PPM is proud to help keep our country’s infrastructure safe and leading the field with cross bore investigation programs.